Epilepsy was first recognized in ancient times and referred to by Hippocrates as the "sacred" disease. But nothing about it seems sacred! Watching your beloved companion suffer a seizure can be an extremely traumatic event. Learning to live with an animal with complex health issues is never easy; learning to live with two dogs with severe epilepsy can be an overwhelming task. Epilepsy manifests in frightening ways, causing a dog to experience sudden, uncontrolled attacks. Living with a dog that has epilepsy can be a daunting prospect, but with the help of a vet and a lot of planning your dog(s) can live a relatively normal life. Common sense combined with medicine can make canine epilepsy manageable. If you are new to dealing with a pet with epilepsy, take a step back and don’t forget to breath. While I can't promise you that everything will be fine, I can tell you from personal experience that sticking with your pet(s) and getting them on a proper medication regimen can lead to many hours of happiness and beautiful memories. I once had a dog that I rescued from a shelter at the age of seven that had epilepsy, which is one reason I chose to read and review this book. I researched a great deal about canine epilepsy after his adoption to be prepared for that inevitable day. Fortunately, he never had one seizure in the nearly three years we had him. Sadly, cancer took him but at least with us he knew what a forever home was. I wish had Living with Canine Epilepsy by A. Piper Burgi back then, just in case. After reading this book, I realized just how very fortunate we were that our dog didn’t have any seizures. I always heard how scary a seizure was and this book illustrated that. This is a biography of a pet owner that lived with two dogs that had epilepsy. Ms. Piper Burgi did a wonderful job of sharing her experiences, good and bad. In order to help her dogs, she experimented with changes in diet and medication. Her insight here is invaluable. There is no reason that special needs or handicapped dogs can’t enjoy life. Nor you. She proved that in Living with Canine Epilepsy. The book needs a bit of editing. Not much. And I could have lived without so much discussion of her husband’s deployments, but other than that, this was a worthwhile read and I’m glad I chose it. I cried for A. Piper Burgi when she and her husband were forced to put Lana-girl and Darren-puppy to sleep. They sounded like two wonderful dogs who deserved better than the short lives they were given. Thanks to the author and her husband, at least these two dogs had a safe and loving home despite having to live with canine epilepsy. This is an enjoyable and quick read. 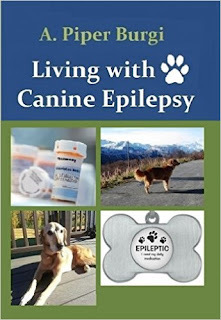 I highly recommend Living with Canine Epilepsy by A. Piper Burgi for owners of dogs with epilepsy. There is no reason that any dog owner couldn't benefit from it either. There are lots of photos she shared. She also provided a wealth of references for canine epilepsy and even some doggie recipes. A valuable resource about living with Canine Epilepsy from someone that knows.